It’s like a Golf, but bigger. And it’s an SUV. Behind the Golf and Polo, the Tiguan is Volkswagen’s third best-selling car, at least in the UK. If you’re surprised at that, it’s likely because the car started off a tad slowly, but year on year it’s benefited from the public’s switch to SUVs, until it sold like a proverbial hotcake last year. When something is so popular, it makes replacing it rather tricky. Huge changes don’t go down well, so Volkswagen has done what Volkswagen does best and played it safe. Very safe. While utterly predictable, it’s still wearing a surprisingly sharp suit. Parked next to the old model, it’s visibly wider and longer, but a tad lower. The collection of sharp edges, a bold grille, and a more muscular stance make the previous generation look positively dowdy, and gives this new version some real road presence. That increased presence doesn’t translate to increased weight. 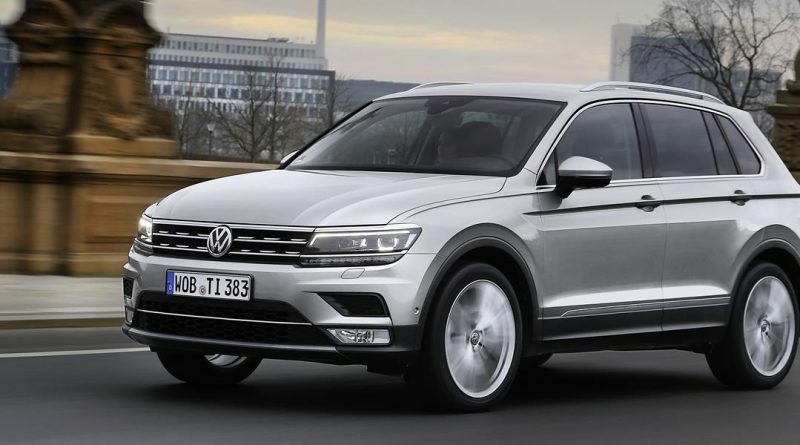 The Tiguan uses the ubiquitous MQB platform – the chassis that sits underneath the bodywork – that’s shared across countless models in the Volkswagen Group as diverse as the Golf, Audi TT, Skoda Superb and, importantly, the SEAT Ateca, and that MQB platform is significantly lighter than the previous architecture. It’s also flexible enough to allow for a variety of drive options, with front- or four-wheel drive being the obvious choices. There’s also adaptive damping and variable-rate steering available as options, while you can raise the ride height by 15mm on Outdoor spec cars or lower it by 15mm with sports suspension. You get a decent choice of engines as well, from a couple of petrol units (1.4 and 2.0-litre) to four diesel options. Oddly, they’re all two litre engines, but power outputs vary from 112bhp through to a hot-hatch worrying 237bhp bi-turbo. Right in the middle is a 148bhp lump that will take the bulk of the sales, and that’s the one I’m testing here. Having just 148bhp pulling along 1.6 tonnes of Tiguan means it’s not the most thrilling of cars to drive, and it’s got to work pretty hard to move things along quickly, but it’s refined once you’re up to speed, with that diesel clatter fading to a distant rumble. If you do want to work it hard, then zero to 62mph takes a surprisingly brisk 9.3 seconds. The real flexibility of the engine is shown in the mid-range, when accelerating from 30mph or so, perhaps for an overtaking move. It’ll never leave you smiling with delight, but there’s a push in the back that you might not be expecting. Tha handling is much the same; it probably grips a bit longer than you might expect it to, but there’s absolutely nothing that engages or entertains. It’s Volkswagen playing safe to the ultimate degree, but the Tiguan is no worse for that. It’s quite Golf-like in its style, in fact, and none the worse for it. That continues inside, where it’s all, once again, utterly predictable, but then the Golf has a fine cabin. The material quality is good – better than in its SEAT Ateca rival – and everything is laid out in a logical fashion. Despite the lower roofline, there’s more headroom inside than previously, and plenty of shoulder room all round. Seven seats are available too but, while those in the middle row of seats get plenty of space, those right at the back might want to start buying the driver gifts as the seats there really aren’t suitable for much more than small children or very short journeys. At least the boot is big, able to swallow 615 litres whatever comes in litre cubes, and it’s wide and deep with it, while a flat loading lip and clever hidden sections makes it an easy boot to take advantage of. Avoid the basic S spec and move to SE or above and you also get a well-equipped car that will satisfy most drivers and, crucially, most teenagers. An 8-inch touchscreen connects to you Apple or Android phone, allowing app-based navigation or music streaming. CamConnect allows anxious parents to wirelessly attach a GoPro camera to the system, enabling a view of any sleeping (or fighting) children without needing to turn round. There’s even an optional connection to allow a tablet to connect via wifi and allow the holder to take over control of the car’s infotainment functions to those in the back seats. As that will undoubtedly be a child or teenager, it would be a brave person to allow that to happen. That all comes at some cost though, with the Tiguan being closer in price to the likes of the BMW X1 and Mercedes GLA than it is to the Ford Kuga or even (again) the SEAT Ateca. This mid-range car, with just front-wheel drive and a manual gearbox, will set back cash buyers a hefty £27,310, but residual values are expected to be comparable to its premium rivals, which will help ease the pain. Also easing the pain will be the economy – the official figures claim 58.9mpg, while my time with the car saw it nudging a still quite impressive 50mpg. However, company drivers might be a tad upset by CO2 emissions of 125g/km, leaving a BIK rate of 25%. The high price and so-so CO2 emission might swing the balance in favour of something I’ve mentioned already, the SEAT Ateca. This offers as much tech, arguably more style, a more engaging drive and better economy for thousands less. However, it misses out on that premium feel that Volkswagen has engineered into the Tiguan, something you can’t really put a price on. It’s also not as spacious or practical, being limited to just five seats. Which means that, should you need that extra practicality, the Tiguan offers everything you’ll want. For everybody else, it just possible that you’ll be better served by looking elsewhere, even though the Tiguan really is very good.